Ogmods has just released a new version of the insta+ and Oginsta+ app with support for Instagram stories. For those who don't know what insta+ and Oginsta+ are, they are the modded version of the original Instagram application with a lot of added features. It also lets you run two different Instagram account on one device. With Insta+, you can download Instagram pictures and video clips directly to your android smartphone. It lets you autostart video with sound, direct share URL, enlarge profile pictures and a lot more. Now you can even download stories on Instagram. => Option to download stories. >> Copy the URL of the Instagram picture or video you want to download. 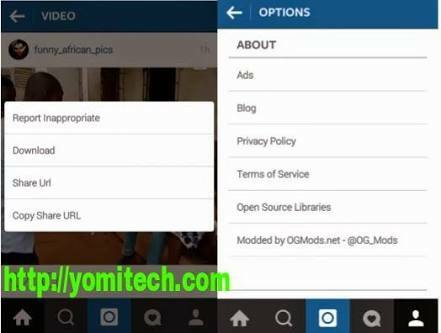 >> Open your browser and open Instagram downloader website by clicking on this LINK. >> Paste the URL of the video or picture you want to download in the provided box. >> Then click on the download button right below it.